Child celebrities have the unique — and frequently challenging — experience of growing up in the public eye. While some of us might have to dig through boxes in the attic, or leaf through old photo albums, to find all of the embarrassing style transformations and awkward stages we went through growing up… celebrities have them on blast to everyone and everybody with google. While we’re definitely wondering why Miley Cyrus didn’t have to suffer through an awkward phase (seriously, what gives? It’s just not fair), we’re really blown away looking at the evolution of her style through the years. When she first came into the public eye for Hannah Montana in 2006, Miley Cyrus looked like the cutest girl in her bible school. Seriously. She’s tiny and innocent and is wearing a knitted SHRUG. This is a girl who definitely doesn’t understand that ‘dancing with Molly’ doesn’t refer to a person. In 2007, she basically looks the same. A little more polished, a lot more mature, but she still looks like somebody you’d buy girl scout cookies off of. 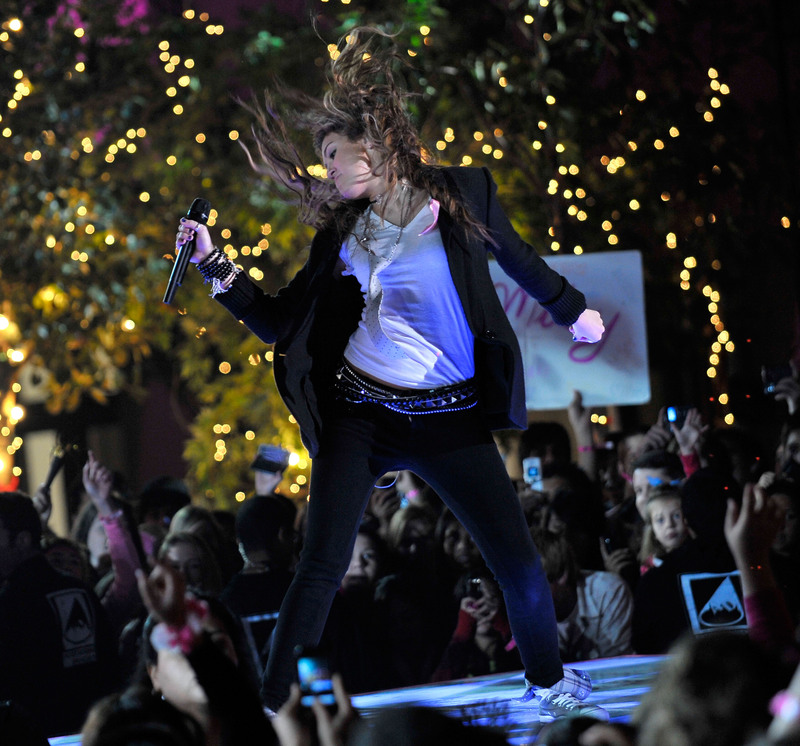 2008 was the year she started to move away from her Disney star image. For her New Year’s Eve performance, she still looks like a baby and she’s basically wearing a blazer, but she’s got a little edge working its way into her style and dance moves. She continues to move toward edgy in 2009, rocking a shiny mini skirt and a ton of ecclectic jewelery. Then, in 2010, it’s almost like she dialed it back. She wore this angelic white dress to the AMAs in 2010, and went back to the lighter locks. Still, she’s got a wrist full of cuff bracelets and that great cocktail ring, along with what looks like some burgundy nail polish… so there’s a little bit of 2008-2009 Miley peaking out. In 2011, she starts to get into a more boho vibe. With her ombre hair and turquoise studded bracelet, plus the combination of animal print and feathers on her dress, this is a more eclectic look for her. Definitely more hippie chick than biker girl, but this look sort of seamlessly blends both. Miley went full bohemian chic in 2011, wearing this dreamy floral hippie dress to the Teen Choice Awards. Not a studded belt in sight. We get it, though. We definitely went through our punk stage and our hippie stage growing up, too — it’s part of the process of finding your own personal style, and it’s actually really interesting to watch Miley’s form. She crosses back into a punky look for the 2012 premiere of The Hunger Games, but there are still some boho details in the embroidery on her skirt and bustier. 2012 Miley Cyrus looks much more familiar! With her short, extreme hair, sharp accessories, and simple black dress with extreme cut outs, its clear she’s settling into a look that feels most true to her. In 2013, Miley seems to have settled into a look that’s undoubtedly hers for her New Years Eve performance. Such a huge contrast to her 2008 outfit! Real talk, though: how was she not (a) sweating her face off on that enormous coat while standing in front of all of those lights and dancing and (b) HOW ITCHY EXACTLY was that gold sequined ensemble? SERIOUSLY. The platinum blonde is definitely here to stay, along with the edgy two piece situation. 2014 Miley looks very similar as she has for the best two years — and as she still does — which seems like a solid sign that this is her just bein’ Miley. And then Miley’s look this weekend at a concert was almost giving us flashbacks to her *rawk* era. Miley Cyrus gets a lot of criticism from the way she chooses to portray herself, but looking at these photos, it’s clear there was a lot of consideration and self-discovery involved in the process! Everybody’s look changes throughout their life as they mature, and become more comfortable looking a way that suits them as opposed to wearing fashions to make other people happy. We totally love adorable baby Miley Cyrus, but we totally salute fearless fashion juggernaut Miley, and hope she never stops her self-exploration.